Online Success Coach Training - Work at your own pace and become a certified coach from the comfort of your own home! "Become a Certified Success Coach From the Comfort of Your Own Home"
Discover how to coach yourself and others to success in any area and even make a living as a professional Success Coach! How would you like to set your own hours, set your own pay and do something really meaningful, all while working from the comfort of your own home? You're probably thinking, "Yeah, right." I mean, nobody gets to live like that, right? That's what I thought when I was still a computer programmer working 9 to 5 in an office "cubical farm". The fact is, more and more people are becoming entrepreneurs. By the thousands, people are quitting their day jobs and starting up their own businesses. The only problem is, most of them lack discipline, drive, and a real plan. It's during these critical times that those people need a coach. And the good news is, coaching doesn't require years of schooling or specifics knowledge about any industry or business. With all these wonderful benefits, you're probably thinking that becoming a coach requires a lot of money or a lot of time. The truth is, you can become a certified coach in just a few days from the comfort of your own home! In just a few hours, by following along with the videos and materials, you'll learn our powerful seven-step method for coaching yourself and others in our CORE Method Success Coach Certification eClass. Within a few days, you'll learn how to coach yourself and others using sure-fire, almost self-working techniques. Upon graduation, you'll be qualified to make an impressive income working from your own home or office with your certificate in Success Coaching you'll earn in this online course. No prior experience is necessary, and no degrees are required. How to create long-term and short-term goals for success. How to take the actions necessary to create success. We're committed to your success both in and out of the training. Michael strives to help make you a success even after you graduate. 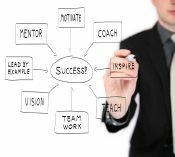 We not only teach coaching, we are coaches, and we're dedicated to helping you become a certified success coach. Bonus Scripts and Forms: You'll get online access to our Member's Only Site including the template scripts and forms we use in our private coaching practice in Microsoft Word format. PLUS, you'll receive success ebooks, including the classic, Think and Grow Rich by Napoleon Hill. Retake the Class Any Time: Once you're a graduate, you can log back in and watch any part of the class at any time, for free. The Best Support in the Industry: Every person in our office is a practicing, Certified Trainer, Master Practitioner or Practitioner of NLP, TIME Techniques and Hypnosis. This means, when you call our office, you will not be given the runaround by sales staff, as with other training companies. 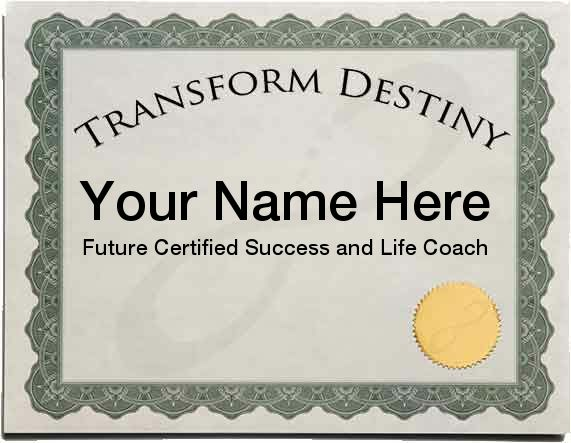 With Transform Destiny, you'll talk to a real NLP trainer who can answer your questions, every time. No other NLP institute we know of can make this claim. This is why we offer world-class, unbeatable support. Just log into the site play the video lessons in your web browser. At the end of the videos, take the short online test and submit a video or audio of yourself doing the techniques. I will personally monitor your results throughout this online certification training and we will be available for questions by email, by message board, and by phone anytime you need us. After completing this short course and turning in your final examination and video, you'll be eligible for certification as a Success and Life Coach - all from the comfort of your own home! This training is approved by the International Board of Coaches and Practitioners, so your certificate will have world-wide recognition. This is a work-at-your-own pace training! You can watch the videos and take the test at whatever pace you'd like, though most people finish it in three to four days. This is an incredible value! A live training with me would take three days and cost several hundreds of dollars more, PLUS travel and lodging! No other training offers this combination of online tools and services specifically designed to create your success with Success Coaching. Now you can get the non-certification version of this course, along with a HUGE selection of our online courses, covering NLP, influence, persuasion, relationships, coaching, therapy, sales and more, PLUS two live group coaching calls each month with NLP Master Michael Stevenson, as part of our Members Only Passport membership.